As seen on Allure, Dr. Hadaegh recommends one of his favorite drugstore teeth-whitening kits. In an ideal world, brushing your teeth routinely would be enough to keep your set of pearly whites, well, pearly and white between routine dentist appointments. But alas, for many of us (particularly those of us with a serious coffee habit), that’s just not the case. 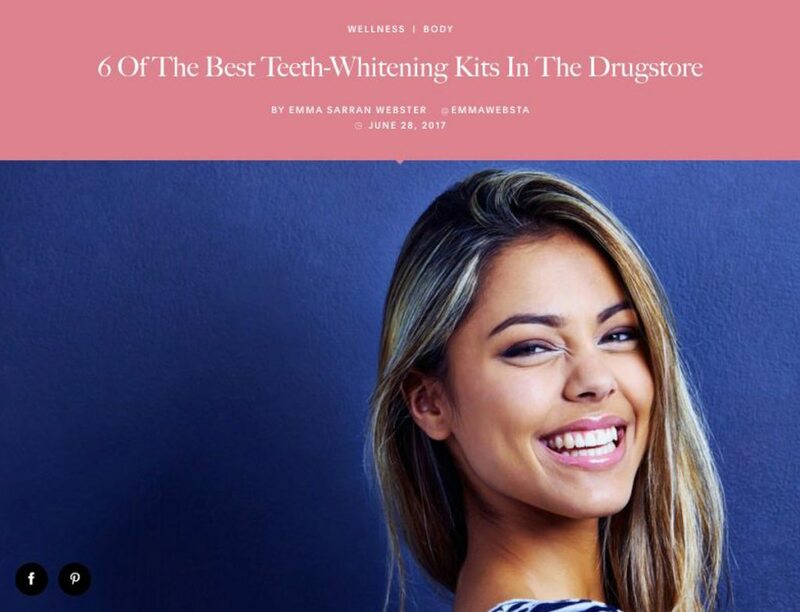 We feel moved to hit up the local drugstore for whitening products to freshen up our smiles — perhaps without giving much thought to what those products actually are and how they work. That’s where peroxide comes in. Dr. Messina says peroxide causes that bubbling to occur, so the active ingredient in whitening kits you buy will be hydrogen peroxide or carbamide peroxide (a diluted version of hydrogen peroxide). “Carbamide peroxide is used because it’s a comparatively stable compound,” Neil Hadaegh, DDS, a cosmetic and restorative dentist in Beverly Hills, California says. “This helps the manufacturer to insure product quality and consistency at the consumer’s end.” Dr. Messina notes that aside from the peroxide, over-the-counter whitening products usually contain some additional ingredient to improve the taste. Ultimately, Dr. Messina says that all over-the-counter, peroxide-based whiteners will deliver comparable results as long as you follow the manufacturer’s instructions for use. One ingredient to steer clear of? Hydrated silica. Dr. Hadaegh says that the substance is “made from a crystallized compound found in quartz and sand [and] can damage tooth enamel and gum tissue.” Aside from that, Giri Palani, DDS, a dentist in Beverly Hills and Palos Verdes, California says the most important thing is to look for when you’re shopping is ease of use. “Also, [you] want to make sure that the product you buy has a good shelf life and you store the product properly ([in] the refrigerator will last longer),” he says. Once you have a kit, Dr. Messina says you can use it for seven to 10 days to start, and then once every other week or so for maintenance. Before you do so, though, consider taking a trip to the dentist for your standard teeth cleaning and to consult on your at-home whitening plans. “Tooth whitening is something that should only be done in a healthy mouth situation,” he says. “If somebody has cavities or periodontal disease, or some other reason why their teeth aren’t white, whitening is not the right choice for them. That’s why it’s always good to have a thorough examination done by your dentist before starting on a whitening program.” Not to mention, if you do the whitening right after having your teeth cleaned at the dentist, Dr. Messina says, you’ll be whitening your tooth enamel itself rather than the tartar or build-up on top of it. Regardless, he says, involving your dentist in the discussion will help you ensure you’re taking the right path. Once you have that conversation, consider one of these over-the-counter kits. When it comes to tray options, Lana Rozenberg, DDS, a New-York-City-based cosmetic dentist, likes Plus White’s 5 Minute system. They cause “very little [tooth] sensitivity, [and they’re] less expensive than the strips but a bit easier, due to the trays,” she says. “The strips or the trays are more effective than the pens because of the prolonged contact of the gel to the tooth,” Dr. Rozenberg says. But, Dr. Rozenberg notes, over-the-counter trays are one-size-fits-all, and the looser ones could allow more gel to seep out. A custom-fit, take-home tray from your dentist is the most ideal scenario, but you can get these “boil-n-bite” trays, which you can (at least somewhat) mold to your teeth, from drugstores. Just be sure to follow all instructions, and let the tray cool enough that you don’t burn yourself when putting it in your mouth! Dr. Messina agrees that prolonged contact of whitener with teeth is key. “What we have to do is keep the whitening agent on the teeth,” he says. “So strips or trays have a better ability to keep the whitening agent against the teeth [than other products like pens] because [the whitening agent is] only effective as long as it stays there and saliva doesn’t wash [it] off.” If you’re having trouble finding trays that fit your mouth well, these more fitted wraps from Walgreens could do the trick. Dr. Rozenberg says that over-the-counter whitening kits should contain from 10 to 35 percent carbamide peroxide (or three to 10 percent hydrogen peroxide) and are most effective at higher concentrations. (Dr. Messina notes that in general, though, manufacturers adjust the concentration based on how the product will be used and how long it will be held against the teeth.) At 25 percent carbamide peroxide, this CVS brand whitening kit hits near the top of the allowable range. Just be sure you use it carefully. “The product with higher concentrations of peroxide [means] higher chances of causing tooth sensitivity if worn for an extended period of time, and may cause gum irritations as well,” Dr. Rozenberg advises. “Do not wear longer than written in the instructions.” There you have it — happy whitening!